The U House offers the ultimate in privacy and full-service luxury. Enjoy the entire house as your personal home base for your choice of numerous sightseeing, shopping, and outdoor excursions or simply hang out and relax. At the end of your adventurous day, the private hot tub patio awaits. Have a glass of local wine in front of the fireplace while planning your next outing. You need only ask and we will provide full concierge service to recommend dining and sightseeing options as well as make those reservations for you. We truly want you to feel at home here. The U House provides the quintessential wine country experience. We offer intimate charm, warmth and character. Family antiques lend a sense of belonging and connection to your stay. Being family owned and operated we believe that excellence lies in the details! Enjoy day trips to the beautiful Oregon Coast, Columbia River Gorge, Mt. Hood or explore the nearby wineries, antique shops and fine dining. I have always loved the historic buildings and close knit neighborhoods in this northern part of Newberg. Many years ago, I was delighted to jump at the opportunity when I saw a realtor installing a 'for sale' sign on the property that would become U House. I've restored four houses in this part of town, nurturing them from various states of disrepair into beautiful homes. My love of antiques shows throughout the house, as many of the furnishings are family heirlooms. In my thirty years of living in the Willamette Valley, I continue to be amazed at the astonishing variety available here. Downtown Newberg is full of character with an intimate, easy-going atmosphere. The mid-valley area is so spectacular in its geography, recreational choices, abundant wildlife, agricultural diversity and artistic community, yet also close to town and city environments. I enjoy being able to go from valley to mountain to desert in a few hours to the east, or west through the Coast Range to some of the most stunning coastline to be found anywhere. Allow us to introduce you to this unique part of the world, or assist you in deepening your own appreciation of what our area has to offer. Welcome to the U House...your home away from home while visiting Yamhill County. This turn of the century home caught my eye years before it became available, and I was thrilled to be able to turn the house into a comfortable haven for travellers to enjoy. This is a beautiful historic area with a friendly neighborhood network, quiet yet close to a wide array of dining and activities in premiere wine country. The wine country mural in the hot tub patio draws your stress out and away with every warm bubbly moment. Family antiques lend a sense of belonging and connection to your stay. Enjoy the flames in the fireplace while placing your cares aside for a time. You need only ask and we will provide full concierge service to recommend dining and sightseeing options as well as make those reservations for you. We truly want you to feel at home here. Antique clawfoot soaking tubs in each bathroom. Newberg has an intimate, easygoing atmosphere with wonderful tasting rooms, shopping, antique stores, and fine dining options within a few short blocks of the U House. Private patio with hand-painted mural of wine country. Private hot tub patio with hand-painted wine country mural. Stunning antiques, private university right across the street (includes public use of track, tennis courts, and pool), walking distance to historic downtown Newberg and award-winning restaurants, more than 20 wineries in less than a 10-minute drive. 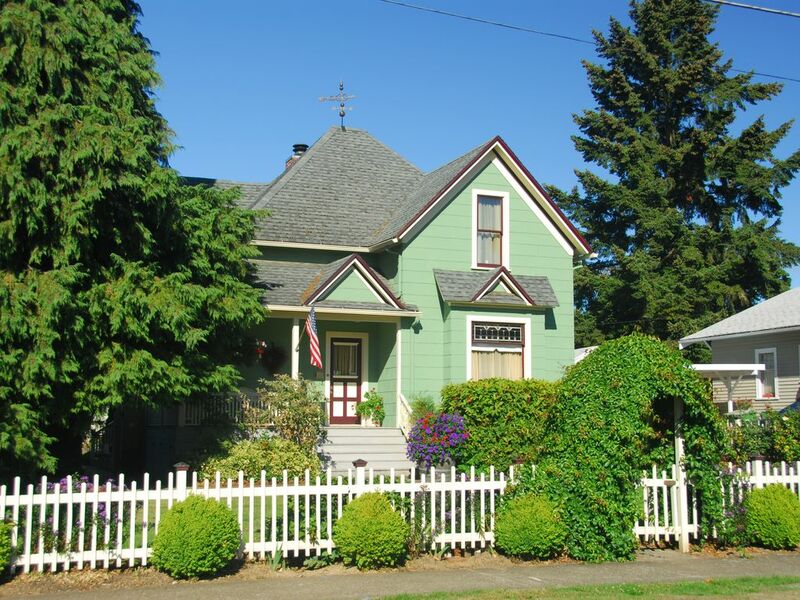 This historic charming house is located a very short walk to downtown Newberg with great restaurants and coffee shops. You can also walk to the fish market grab something on interest and grill it outside next to the covered jacuzzi! They are the best of the best hosts! Highly recommended in wine country! the place was absolutely great and the hostess even better. It had everything you need for a pleasant stay (you didn't have to go to the store for the minor stuff). the location was right in the middle of everything. Leigh recommended some great wineries and is available 24/7. If I am in Oregon again, this is the place I would stay! We thoroughly enjoyed the house, especially the hot tub and outside sitting area. My husband and I stayed here with another couple and had a very enjoyable experience. The house is well equipped with everything you need. It is well situated to walk to restaurants in Newberg. We did expand our dining experiences to nearby Dundee and McMinnville. There are several wineries nearby as well. Leigh is an amazing host and is there for you if you need anything or have any questions. Highly recommend this property. The UHouse was a wonderful place to stay. It was the perfect combination of vintage while having the modern conveniences we seem to need like TVs, internet, air-conditioning ,etc. The décor was wonderfully done. The owner was a perfect combination of helpful if you needed it and left you alone if you wanted that. Would definitely stay here again. Charming older house in a great location! The U house is perfectly located for a weekend wine tasting trip in Willamette. Leigh is a gracious host and provided all the info we needed including a cornucopia of free wine tasting vouchers! The house is close to a great coffee shop and to Ruddick Wood for dinner and late night snacks. Off-street parking for multiple cars is plus. Plenty of bedrooms. We had the one with the 3d stars at night, pretty cool :) The hot tub was private, well maintained, and used every night we stayed. Kudos for having one! Each bathroom had a claw-foot tub, one setup for running a bath downstairs, and either a shower or bath upstairs. Unique IMO. Overall, we had a great stay and would recommend. Centered in Yamhill County's Wine Country, The U House lends itself to endless opportunities for adventure; a comfortable base to explore beautiful Northwest Oregon. Numerous award-winning wineries await you as well as four-star restaurants, multiple museums, antique shopping, art galleries and outdoor activities. Rates are subject to state and local lodging tax of 10%. See our website for complete policy details.